My mosaics are triple-sealed (the base before I start, front and back afterwards). They can be hung outside if they're under cover (a porch, an overhang, say, or a breezeway). Sun won't hurt them. Getting a bit wet won't hurt them, but getting continuually drenched is not a good idea. Freezing when wet is a bad idea, so I advise taking them in the the winter months. Of course, banging in the wind is a definite no-no. This one sold at Glendale Gardens, where you can find me in the centre circle every August when they have their Art and Music Day. 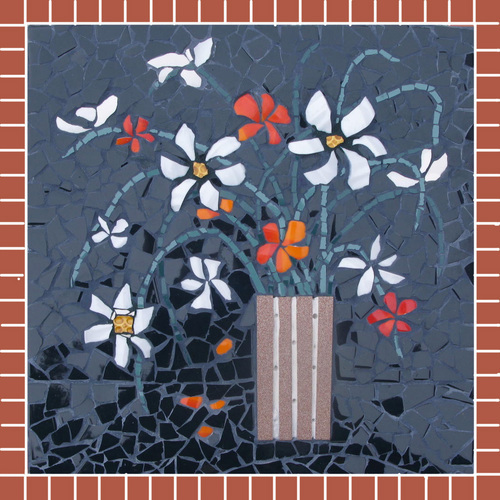 I will also beteaching a mosaic class at Glendale Gardens in March. 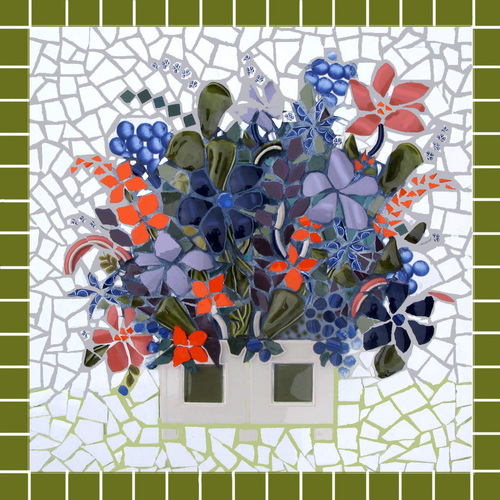 This is another one of my mosaic panels, which all measure 2 feet x 2 feet. of ceramic tiles and broken china. For this one, I used recycled Waterford crystal goblets (for the vase), tea-pot lids, pill-bottle lids, buttons, and, of course, broken china (the white backgound) and ceramic bathroom tile (the terra-cotta-coloured edge). 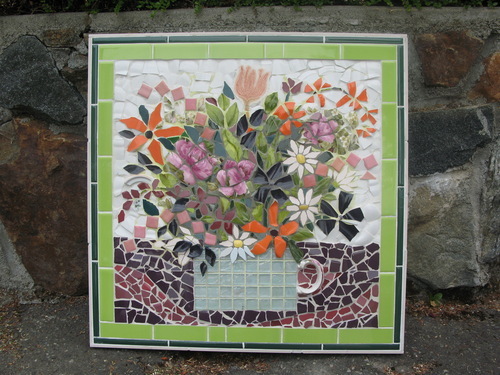 Another triple-sealed 2 ft. x 2 ft. mosaic panel. I love the way mosaics catch and reflect the light. They sparkle! I like to help people feel better about breaking favourite plates, vases, etc. 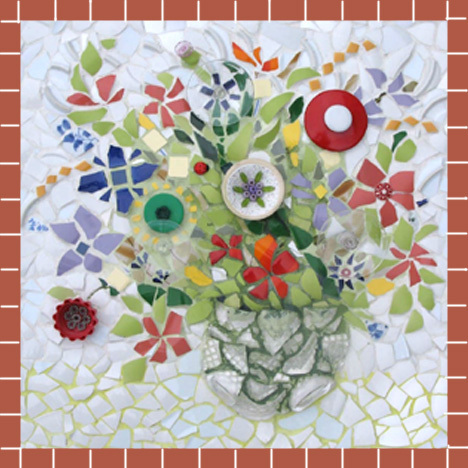 by incorporating them into mosaics. I also like to use found objects. In this case, I used a friend's broken teapot (see the spout there?) 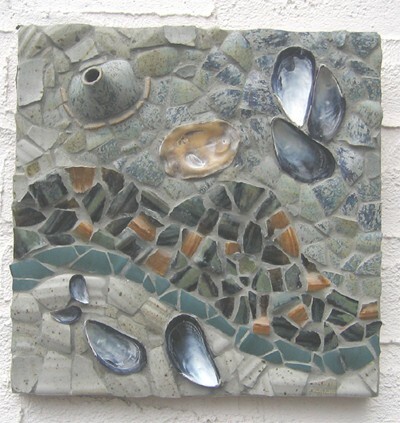 and sea shells from the beach near her house....she hung it in her bathroom. I also paint.....abstracts. people walking in the rain, landscapes, mandalas....come see!